As a Black man pushing 50 years of age, I know full well that I’m not exactly in the sweet spot of Essence magazine’s demographic. Indeed I doubt my cohort is being targeted by any major magazine. Perhaps this is why I feel compelled to read Essence every month — even though I know I’m not going to find very much of interest. 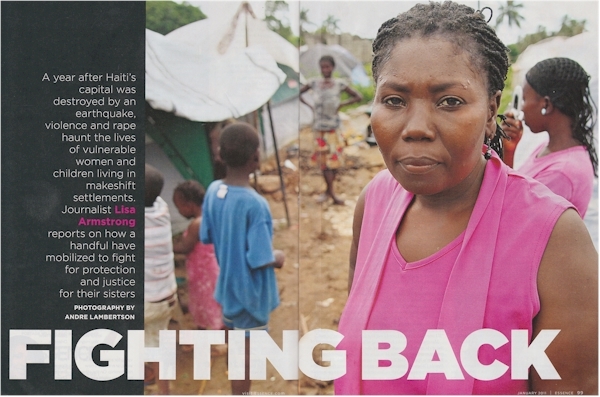 The point of this blog post is to highlight a terrific article: Journalist Lisa Armstrong wrote a deeply moving piece about how Haitian women and children are suffering from rapes and sexual abuse, in the “makeshift settlements” setup, in the aftermath of the terrible January 2010 earthquake. Armstrong’s article was supported by moving photographs taken by award winning photojournalist and filmmaker Andre Lambertson. Armstrong not only described the horrors experienced by the victims, more importantly, provided a wealth of information about what we can do to help. Curiously this, the most substaintial article in the issue, escaped mention on the magazine’s cover. I was left with one nagging question after reading this article, and I hope someone can help me understand: Why are these rapes, particularly of the young girls, occurring? I don’t understand the psychology behind this behavior. In fact, it is the exact opposite of what I would expect from people during tragic times. If someone can direct me to some literature on the subject — I’d appreicate it! And bravo to Essence on a great article.